Welcome to this week’s “Top Ten Tuesdays” post. Today we are being treated to a list of the top ten things to do in the African country of Namibia thanks to Kirk Shackleton. Enjoy! Encompassing an area of nearly 23,000 km2 at the top of Namibia, Etosha National Park is one of Africaâ€™s largest game reserves, home to more than 114 species of mammal that can often be spotted refreshing themselves around one of the areas numerous waterholes. The area appeals to all lovers of nature, from those experiencing Africa for the first time, to professional wildlife photographers who return time and time again. 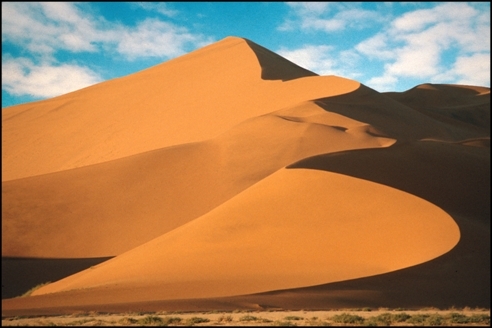 Soussusvlei is similar to Mississippi in that it has four Sâ€™s in its name. Otherwise itâ€™s completely different. Looking a bit like a muddy oasis in the middle of a desert, Sossusvlei is a salt and clay pan surrounded by towering sand dunes that look like theyâ€™ve jumped straight out of Arabian Nights. It is these banks of sand that are the real attraction here, drawing in swarms of photographers for whom the effects of light on the dunes at sunrise and sunset are akin to a train spotter catching glimpse of a steam engine. Twyfelfontein is a somewhat inauspicious Afrikaan word that means â€˜doubtful fountainâ€™, but thereâ€™s no doubt that this is one of the most important places to head once you arrive in Namibia. The countryâ€™s first UNESCO World Heritage Site preserves around 2,000 paintings and engravings upon the rock faces of its mountains, traces left by the nomadic San and Damara people that lived in Namibia an estimated 6,000 years ago. The Caprivi Wetlands sound like they might almost be Italian. Almost, but not quite. In fact, like most things in Namibia, the Wetlands couldnâ€™t be more different to anything youâ€™ll find in Europe. Nor can they be likened to the rest of Namibia, for that matter. Four large rivers mark the boundaries of this swamp region, which, in turn, mark the boundaries between Namibia and its neighbours. The result is an area bulging with wildlife, lush tropical vegetation, and a great many cultures for whom these waterways are home. The Skeleton Coast is a pristine section of Namibiaâ€™s northern crust that stretches between the Ugab and Kunene rivers, and is easier to access from the south than the north. Its name is apt; this area has seen a number of miseries and shipwrecks, along with a number of incredible adaptations by Mother Nature to an isolated and barren landscape that is truly off the beaten track. Fish River Canyon sprawls across Namibia like the branches of a leafless tree, but you can only really appreciate this from above, which is probably why these kind of places are so often circled by gigantic birds of prey â€“ theyâ€™re enjoying the view. It is claimed that hiking this canyon is one of the top 5 most challenging things to do in Africa; if youâ€™ve ever tried hiking a canyon, youâ€™ll probably agree. Keep an eye out for interesting rocks, if you like rocks. Some people say the Kalahari Desert is underrated, and itâ€™s easy to see why. Endless undulations of red sand dunes are punctuated only sporadically by grass plains, the equivalent of a sand pit the size of Texas with a few fields dotted here and there. Thatâ€™s about it. But because itâ€™s underrated few tourists go there, and thatâ€™s exactly why itâ€™s one of the countryâ€™s top ten destinations. Here you will find absolute solitude and peace. The fantastically plosive Swakopmund is a city that oozes German colonial charm and is cherished by locals and visitors alike â€“ many streets retain their German name. It benefits from a cool location beside the Atlantic Ocean, and has developed into one of Africaâ€™s most popular adventure destinations. Of all the restaurants in Namibia, some of the finest can be found in Swakopmund, an excellent base from which to explore the rest of the country. A lot of people think that Africa is full of spear-wielding tribes. While this is not entirely accurate, there are a great many tribal cultures across the continent, and Kaokoland is an ideal place to see how these indigenous peoples live. The area is a majestically barren desert that sits just inside the Skeleton Coast, and is home to the Himba people that still live traditionally among the basalt mountain ranges. Take the opportunity to interact with them; you might even be invited to a meal – eating out Namibia wonâ€™t get more authentic than that! Bushmanland is the imaginatively named home of the Bushmen people, the last large community of San people, many of whom still live traditionally and in harmony with nature. This area is very sparsely populated, and few tourists make the venture, but those who do are richly rewarded with much to see in the way of culture and wildlife. The path doesnâ€™t get any less beaten than this. The content and photos are not the property of BackpackingWorldwide.com but are used with permission. Namibia sounds awesome. I have always wanted to visit the Kalahari after watching the movie “the God’s must be crazy.” Cool photo of the elephant by the water’s edge. I like your Top Ten lists! Those sand dunes are awesome – would love to see those. Actually, Namibia sounds like a place I’d like to visit for at least 10 reasons. What a diverse landscape – rivers, parks, wildlife, deserts! There is a lot to do there! Love that photo with the elephant! Yea, seriously… Each week I do one of these things I add a new place I want to go to my list, haha. Great list of things to do in Namibia. Loved the picture of the desert sand. Makes me want to visit this amazing country. Yea that is a cool picture, hopefully I can get there one day to take my own! Interesting place- I’ve never been to Africa, but from this post and what other bloggers have said about it, it seems like I need to move it higher on my travel list. Skeleton Coast sounds pretty interesting too. I’m really digging these Tuesday Top Ten posts. 🙂 Twyfelfontein sounds like a really cool place to see… and not just because of the name! WOW, looks amazing! Africa is high on our list of places to go, but since we’ve never seriously contemplated a trip there, I wouldn’t know where to start. I guess I do now. All those places look and sound amazing. That picture with the elephant is just incredible. I can’t imagine being that close to an elephant out in the wild. Simply incredible. And your comparison of Sossusvlei to Mississippi is great. I was cracking up. Well done. Well it wasn’t my comparison, it was Kirks, but yea I laughed as well, haha. It would be worth the trip all the way to Namibia just for that one photo of the sand dunes alone. Beautiful! Namibia ranks as one of my most favourite places I’ve ever visited. I’ve done about half of what you’ve suggested. It’s a great list. Lucky you! I’d love to have even one of two of these. Great suggestions. I’ve only ever been to Windhoek and want to see much more of Namibia. The closet I got to the Kalahari was in Upington in South Africa. So close – yet never made it. Hoping to get to Namibia on my next trip to SA. Well I haven’t even made it to the continent yet… So you’ve got me beat, haha. Mu girlfriend has been to namibia. Needless to say being German she found swakopmund bizarre and charming! Yea I’ve heard some good things about it. I’m sure it would be interesting visiting as a German. I have always wanted to visit Namibia. you have given even more reason to get over there. Love the photo of the elephant too! Great read! I am from Namibia and shockingly enough, I have only done 5 out of the 10 on your list. I must agree that hiking the Fish River is indeed very challenging but possibly the best ‘Namibian’ experience I have had so far.